As United States’ Under Secretary for Political Affairs Nicholas Burns begins his crucial round of two-day talks here with senior Indian officials on the Indo-US nuclear deal tomorrow, the UPA government today upped its ante on the sensitive issue of India’s fast breeder reactors. Days ahead of his visit to India, US President George W Bush today said India has to separate its civilian and military nuclear programmes and bring the civilian ones under IAEA safeguards which he admitted was not an easy decision to make. Has justice been done in the Jessica Lal murder case? 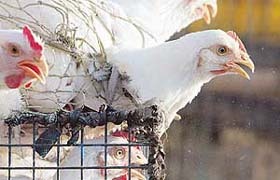 The government today said there was a distinct possibility of bird flu virus having infected some humans in the affected areas even while stating that no new cases in poultry have been reported. Sold chickens peer from their cages at the Ghazipur poultry market in New Delhi on Wednesday. Four boys, three of them minors, were killed in an incident of firing at Dodhipora village near Handwara in Kupwara district of north Kashmir this afternoon leading to protest by locals against the security forces. The police and the security forces said the firing took place when a search party of the Army was fired upon by militants hiding in the village. Who said we are going to put the FBRs in the civilian side? We cannot and will not do so. Taking notice of a custodial death, the police authorities have dismissed from service four policemen accused in the case. The defreezing of the two London bank accounts of controversial Italian businessman Ottavio Quattrocchi, a key accused in the Bofors pay-off case, rocked the Lok Sabha today with an agitated Opposition demanding an explanation from Prime Minister Manmohan Singh on the issue. The “dead” terrorist issue echoed in the Lok Sabha for the second day today, with BJP member from Punjab Avinash Rai Khanna raising the issue, which was duly supported by Shiromani Akali Dal members. The All-India Democratic Women’s Association today expressed shock over the acquittal of all accused in the murder of ramp model Jessica Lal and demanded the state appeal against the verdict and reinvestigate the case. 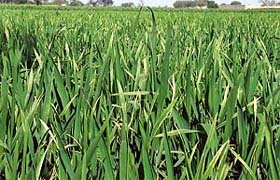 A spell of frost in the initial phases and sudden increase in temperature in the later stages of Rabi season has spurred apprehensions of 15 to 20 per cent production loss among wheat farmers of the region. A view of pale wheat crop near Talwandi Sabo.